In the late 80s, after the popularity of Piper’s Pit, non-wrestling talk segments became popular. In an age where the television show was really an infomercial for things they were marketing, such as PPVs, toys, and other merchandise, having personalities interview other personalities was a useful way of starting and progressing storylines, because there’s only so many times you can watch the same guys beat each other up. The Funeral Parlor was one of these segments. The Funeral Parlor was just that. It was a very dreary stage setup made to resemble a real funeral parlor. Paul Bearer, manager to The Undertaker, would interview wrestlers on this set. 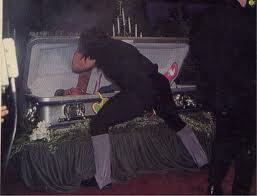 There were few memorable Funeral Parlor segments, but the one featuring The Ultimate Warrior stands out. The Warrior was fresh off a victory at Wrestlemania VII against Macho Man Randy Savage in a match that “retired” (kayfabe) Macho Man; they kept Macho Man on the payroll as a heel announcer for WWF Superstars, but The Warrior continued his wrestling for the WWF. Kind of. It’s difficult to predict exactly where the Warrior was going with his career, but the appearance of The Warrior on The Funeral Parlor was a perfect setup for a feud with The Undertaker. You can watch the video of this unbelievable segment here: http://www.youtube.com/watch?v=rNg95xuwuCs It’s 10 minutes long, but there are many things I’m about to extract for you.